As much as I want to get into my own little routine here (so it is not such a shock when LRUN goes back to work) I worry this is not the best thing. LRUN is one of those people that has to be busy. All the time. He doesn't do 'just chillin.' Today, I have noticed that he is a bit grumpy and I guess may just be that little bit bored. So I let him do stuff. And not just the poo nappies. Honest. I let him push the buggy. I let him feed LBM lunch and put him to bed. This makes him so much happier. He feels needed. Wanted. Important. I was on a skype call to my sister and he said he would do the poo nappy. He did such a good job, that LBM actually rolled over and clapped handies. No kidding. He actually applauded his dad's nappy changing skills. Much to the hysterical laughter of the audience. So I have a few minutes to try these new Winter Cookies from the Barefoot Contessa. 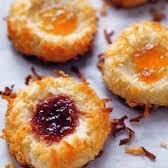 Jam Thumbprints. A batch is currently in the oven filling the house with toasted coconut smells. Sure beats dog and baby poo. It's going to be tough on both of them when LRUN goes back to work. He will leave the house before the LBM is awake and will return after he has gone to bed. 5 days a week. Social services didn't seem to care about this. They were more worried about me coping on my own. I will be fine (well.. mostly) but poor LRUN is gonna miss his little boy a lot. Maybe we could do a skype bed time story on the train journey home. All depends if LRUN wants to risk shattering his manliness in public. Pinky Ponk versus the new Landrover Defender. That should be entertaining. Snigger.